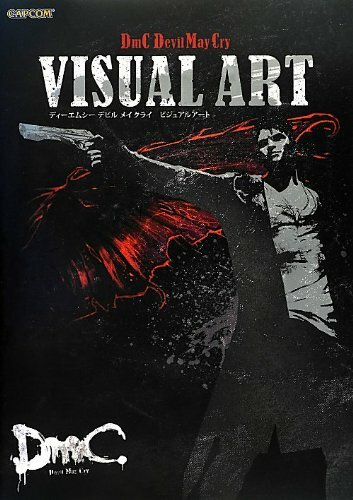 This is the video game artbook for DmC: Devil May Cry (PS3 | Xbox 360), the fifth title Devil May Cry series. The game was released in January 2013 and this artbook in March. It's a Japanese artbook, 192-page paperback. The first chapter collects the illustrations. The art is beautiful and stylishly painted. The lighting always has that eerie feel to it. The second chapter features the character designs and weapons. They are all coloured with some nice details going on. However, there aren't a lot of characters, though for each you can see different designs. Next chapter is bigger and covers the devils or demons. There are lots of cool monsters and creature designs to check out. It's difficult to describe them but them are definitely less grotesque compared to the mutated and disgusting enemies from Biohazard 6 or the Biohazard (Resident Evil) series for that matter. There's a different though as some of the enemies here have armor-like or hard-looking skin, basically they look like they can crack. The last chapter on environment art is also quite sizeable with 60 over pages. The artworks are arranged by the stages, or missions, and there are around 2 per pages so they are quite big. The environment designs look great. There are interestingly designed places, such as floating buildings or lands, a huge giant face monsters sitting on a water fountain of an European-like town, buildings that are collapsing, overlapping or have parts that are breaking off and flying away. The last few pieces are quite epic with the destruction and scale of the enemy. Nice artbook. The highlights are the creature designs and environment art. Will this book ever be translated into english version?